It took less than 10 days to sell all but 10 of the 1,110 residential units at the Transit City Condos development as part of SmartCentres Place in Vaughan, Ont. “The site itself, with access to multi-faceted transit, major highways and a nine-acre park, is truly exceptional and represents the culmination of many years of hard work and the playing out of the vision of Mitch Goldhar, our partner and chairman and the ultimate driving force behind SmartCentres Place in the Vaughan Metropolitan Centre,” said SmartREIT chief executive officer Huw Thomas. * and CentreCourt Developments, which has completed nearly 2,000 homes in the past five years and is actively developing an additional 3,000 homes throughout the Greater Toronto Area. “We had previously indicated a total construction cost of $365 million for the two towers and associated parking, and we are continuing to refine this number,” said Thomas. 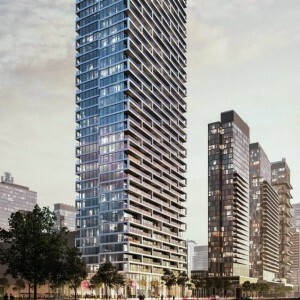 As a result of the strong sales, SmartREIT is amending its previously announced guidance by increasing profitability on the two 55-storey condo towers to an estimated return of 25 to 30 per cent on costs from the previously announced 15 to 20 per cent. “Our final average pricing was in excess of our original expectations, which had been reasonably conservative given this is the first residential development onsite,” said Thomas. Prices ranged from $321,900 to $610,900 for suites varying in size from 503 to 950 square feet in what will be the tallest buildings in Vaughan, according to the Transit City website. Optional above-ground parking was an extra $40,000 for those purchasing units of 699 square feet or more. The site is on Highway 7 and in close proximity to Highway 400. A new Vaughan Metropolitan Centre subway stop will soon connect the Transit City site to downtown Toronto. It will also be home to the new VIVA transit rapidway and York Regional Transit central bus station. Transit City’s buildings were designed by Diamond Schmitt Architects, with interiors designed by figure3 and Claude Cormier + Associés handling the landscaping design. Construction of the two towers is expected to begin later this year, with initial occupancy slated for late 2020. Transit City will also feature the first Buca-branded restaurant and Bar Buca outside of downtown Toronto in the lobby of the north tower. SmartCentres Place has been planned as a complete pedestrian-oriented community with a mix of uses — including up to 10 million square feet of office, residential and retail space — anchored by a large central park with many connected open spaces throughout its 100 acres. The first office building in SmartCentres Place, the 14-storey KPMG Tower, is open. Construction is underway on a 220,000-square-foot mixed-use building that has PwC as its lead tenant. It includes a 100,000-square-foot flagship YMCA with childcare and health and fitness facilities, a 20,000-square-foot Vaughan Public Library and a studio space.